Wasn’t last week’s sew-along fun? I hope you’ll post photos of your finished dresses to the SewLisette Flickr group. 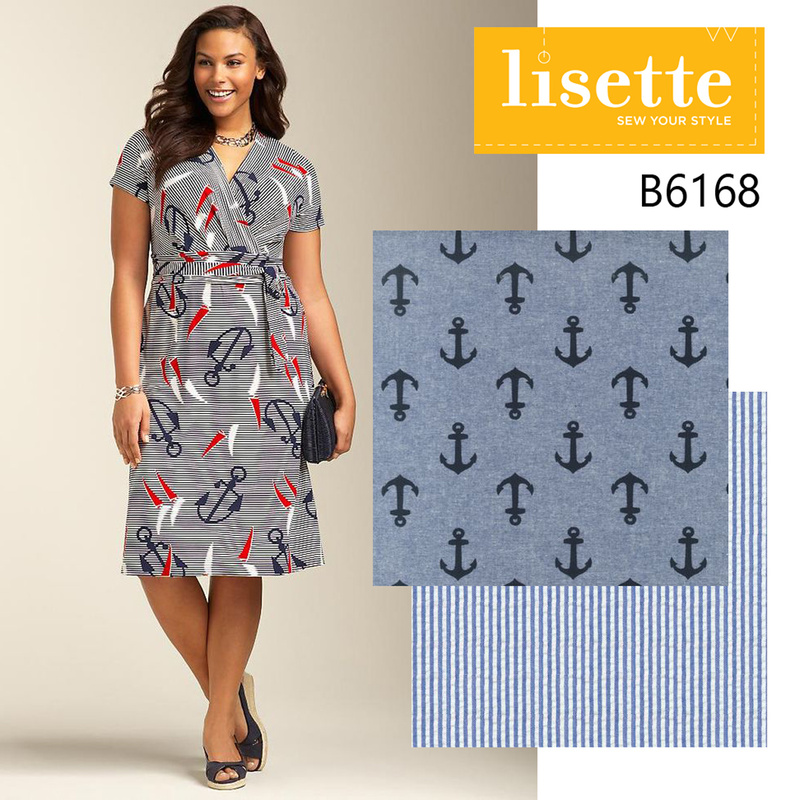 In the meantime, here’s a fun spring and summer idea for the fit-and-flare dress, B6168: a nautical-themed dress! 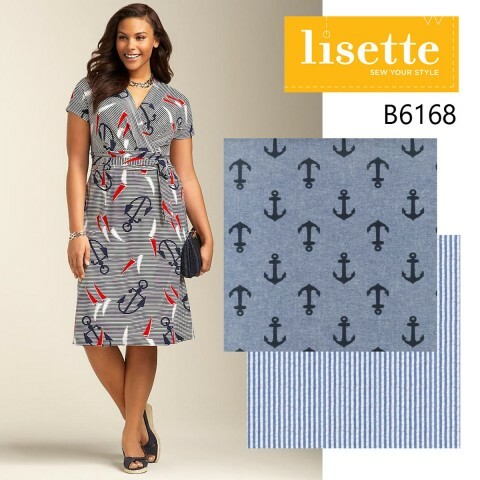 For this look, try this anchor-printed chambray from Robert Kaufman. And blue-and-white striped seersucker would give a cute summer vibe, too. Thanks so much for showing a larger size version of this style of dress, I was still really uncertain about how it would look on me, and this really helps. I’m starting on mine today, finally, and thanks to this blog I have an excellent tutorial series to refer to. Can’t wait to take a pic of the finished product. You know, I wasn’t too enthusiastic about this pattern as I’m a curvy girl, but seeing this version has changed my mind. I have a maroon/grey pinstripe that would match my moto jacket and be work appropriate. I suddenly think this pattern and that fabric are a match! OK-finally finished my version of this in the tunic top view. Depending on your particular plus-size body type, you may want to make a few changes. I am an apple shape. The fitting suggestions for the bust were fantastic, it looks quite nice and fits really well through the bust. And OH those sleeves-be patient, take your time, and they will set in LIKE BUTTAH. The sleeves are just perfect, seriously. Love ’em. The skirt part is where you need to be careful-if you’re an hourglass plus size, this will probably look fantastic just as it is, especially if you are careful to use a lightweight fabric. There are gathers at the center front and back. If you are an apple plus size, I strongly encourage folding out the gathers on the pattern. I did not do this and the gathers, ON MY APPLE SHAPED BODY, simply did not work. I took the skirt off, removed the excess fabric, and restitched it as an a-line. The tunic was a bit long for me, but again, you need to find the sweet spot on your own body, for someone with a longer torso and/or longer legs the length would likely have been fine. I took off a couple of inches and it worked very well. Normally I have to add length in any top, but since the bust alteration works so well I didn’t have to do that this time. All things considered-I really like the top, it’s EXTREMELY flattering to any bust size- it makes you curvy if you’re not, makes the already curvy very va-va-voom but not in an over the top way, though there will be cleavage through the peep-hole if you’re anything over a c-cup. It looks a lot better on the body than it does on a hanger, too, so do not despair if it looks like a bag on the hanger, it definitely needs to be filled in to look its best!